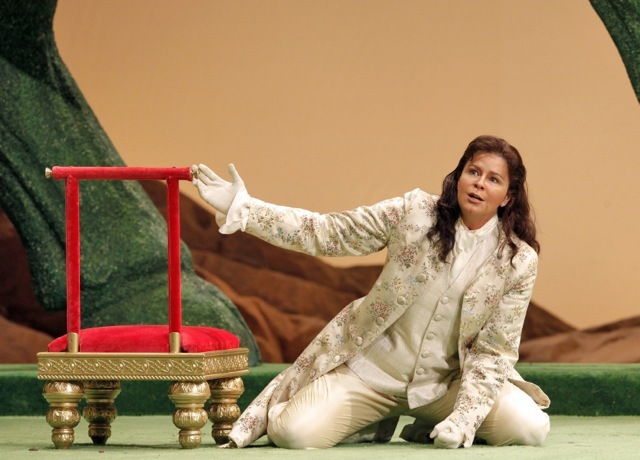 Susan Graham (Xerxes). Photo by Cory Weaver. Everything is old about Handel’s “Xerxes” — the Persian king and conqueror lived in the fifth century BC; the opera was written in 1738; the English production seen in the War Memorial is from 1985 — and yet this San Francisco Opera premiere feels fresh and new. Musically, it’s a grand-slam winner, with a cast as good as you can find anywhere: Susan Graham (Xerxes), David Daniels (Arsamenes), Lisette Oropesa (Romilda), Heidi Stober (Atalanta) in the top rank, closely followed by Sonia Prina (Amastris), Michael Sumuel (Elviro), and Wayne Tigges (Ariodates). This was a well-balanced, relatively egoless, and all-around outstanding vocal performance. It’s a true ensemble event, even if the opera is a nonstop series of arias, originally a showcase for London’s most famous castrati. Acting is uniformly natural and fluent, thanks in part to Revival Director Michael Walling. After minor, needless initial problems with stage placement for Graham’s affecting “Ombra mai fu” (in praise of the shade of his beloved plane tree), misdirected to be sung way up-stage, instead of near the down-stage sweet spot, and Oroposa singing her first aria while surrounded by supernumeraries and virtually unseen by the audience, three hours go by essentially without a hitch. 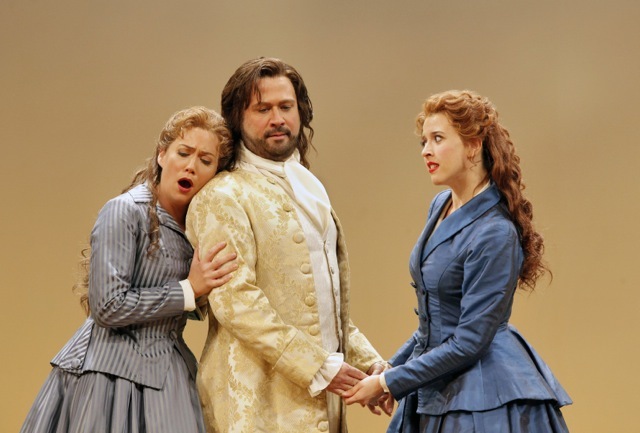 Heidi Stober (Atalanta), David Daniels (Arsamenes) and Lisette Oropesa (Romilda). Photo by Cory Weaver. Under Patrick Summers’ steady direction, verging on the mechanical only a few times, the SF Opera Orchestra plays superbly, with principal trumpet Adam Luftman providing a triumphant sound. 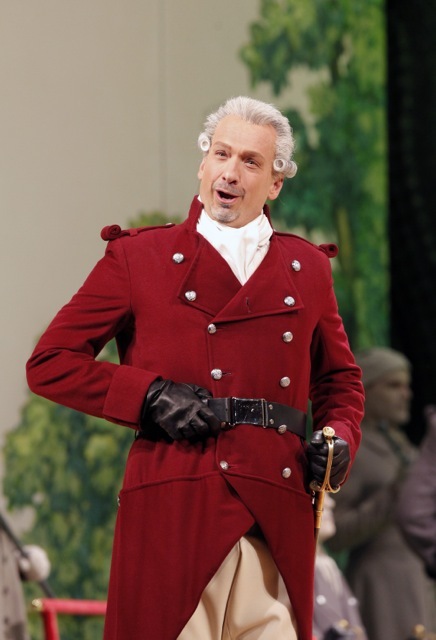 Summers, who has been responsible for several excellent Baroque opera productions in the War Memorial and elsewhere, is masterful in the genre. And yet, a word of caution to opera newbies: this beautiful music may not hold your attention all evening long. Nicholas Hytner’s production, with David Fielding’s design, from the English National Opera, moves along the admittedly static work, without any action to speak of, investing it with clever, amusing, and times very funny bits. Besides the information and entertainment value of the production, it must also be acknowledged for not calling attention to itself, helping the drama, not competing with it. A troupe of supernumeraries, looking like ghosts, acts as entertaining stagehands, rarely stepping on the music. This was one of Xerxes’ many bizarre historical incidents. When the flax-and-papyrus bridge collapsed over the Dardanelles, the king executed the architects, and ordered the straits lashed 300 times, branded it with hot iron, and had his soldiers shout at the water. But Xerxes was also persistent: his second Hellespont bridge stayed up, and allowed the Persian troops to invade Greece. Wouldn’t that make a more lively opera than this one all about his affairs of the heart? 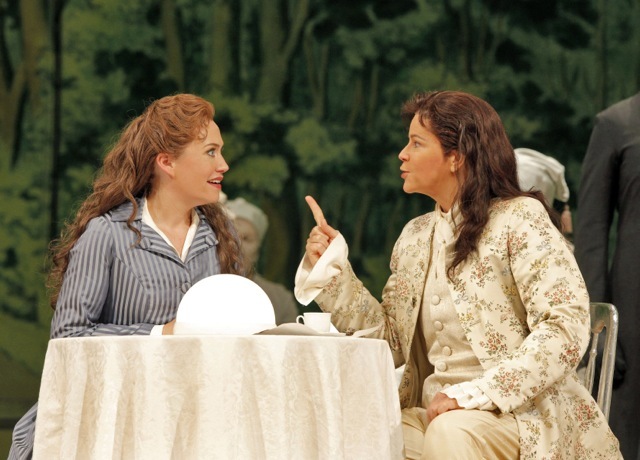 Heidi Stober (Atalanta) and Susan Graham (Xerxes). Photo by Corey Weaver. Wayne Tigges (Ariodates). Photo by Cory Weaver.